100% Natural and best quality Black raisin from the house of Tulsi. Tulsi Black Raisins Seedless is made from small Black Corinth grapes, tangy in taste and very dark in color. Black raisin, the most popular variety of dried grape. Black raisins are that typical kind of fruits which sports good amounts of glucose and can be consumed on a daily basis. 100% Natural & Premium quality Walnut Quarters from the house of Tulsi. Best quality, amazing taste, soft in chewing. Best to use as an ingredient in cooking. Walnuts have Vitamin E and omega-3 fats. It supports brain health. Walnuts are a rich source of antioxidants and healthy fats. Storage information- Keep it cool and dry place. Bestseller product from the house of Tulsi. Hygienically packed and no artificial ingredients. Prevent heart diseases and heart attack. Helps to control blood sugar level. Good source of manganese and copper. Supports healthy brain function. Storage information- Keep it cool and dry place. Bestseller product from the house of Tulsi. Healthy ready food to curb those hunger pangs. Prevent heart diseases and heart attack. Helps to control blood sugar level. Good source of manganese and copper. Supports healthy brain function. Storage information- Keep it cool and dry place. Best quality product from the house of Tulsi. These cashews come in box packing. Best quality Cashews vacuum packed to retain the optimum freshness. Cashews are naturally cholesterol free. Cashews are high in vitamin E, K, and B6 along with minerals. Storage information- Store in a cool and dry place. Best quality walnut. Soft in chewing. Rich source of energy as it has got all the minerals, nutrients, antioxidants & vitamin. Four walnuts in a day increase blood level. Rich source of antioxidants and healthy fats. Supports brain health. Storage information- Keep it cool and dry place. 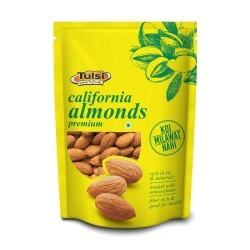 Best quality pistachios sourced from California USA. Delicious taste and lightly salted to keep the sodium low. Beneficial for eye health. Good source of copper, magnesium, potassium, vitamins. The omega-3 fatty acids help lower your blood pressure. Storage information- Store in cool and dry place. Best quality Walnut. Soft in chewing. Healthy ready food. Rich source of energy as it has got all the minerals, nutrients, antioxidants & vitamin. Increase blood level. Reduce several of the risk factors for heart disease. Supports brain health. Storage information- Keep it cool and dry place. Bestseller product from the house of Tulsi. Delicious crispy taste and lightly salted to keep the sodium low. Healthy ready food. Beneficial for eye health. Good source of copper, magnesium, potassium, vitamins and phosphorus. Helps in lowering cholesterol levels. Storage Information- Store in cool and dry place. 100% Natural Anjeer/ Figs from the house of Tulsi for daily home use. Tulsi Anjeer /Figs Lazeez is a high-quality product with good taste and many health benefits. They are a nutritious snack and good for stamina. This is an agricultural product of Afghanistan. Storage Information- Keep it airtight & refrigerated for optimum freshness.